Show Racism the Red Card worked with CPFC Study Centre and Crystal Palace FC to organise an event for young people from local schools on November 10th. Year 5&6 pupils from Elmwood Junior School, Croydon came to Selhurst Park to take part in three educational workshops from SRtRC and CPFC Study Centre. The SRtRC workshops examined Racism, stereotypes and where they come from and the Study Centre workshop encouraged young people to create their own designs for a SRtRC T-Shirt. The designs created by participants could be entered in the SRtRC School Competition 2017. It was a great morning and the pupils from Elmwood engaged readily with the sessions, taking part in discussions and working together in group activities. 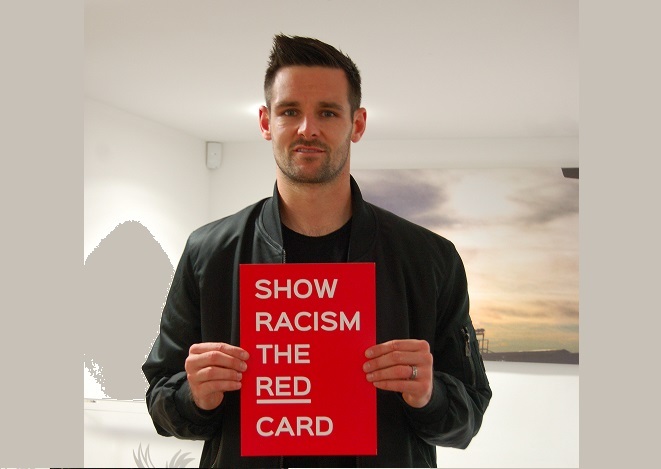 In the afternoon, we were able to screen the Show Racism the Red Card film and encouraged attendees to think of some questions about racism that they could put to a panel of special guests. Just after the film screening the young people had the opportunity to meet, Crystal Palace FC club captain, Scott Dann. He was happy to sign the new SRtRC / CPFC posters and take photos with all. SRtRC Education Workers and former professional footballers Francis Duku and Lionel Morgan were on hand to take questions from the young people and shared their advice and experiences of racism. There were some excellent questions and SRtRC provided some mini-footballs and T-Shirts for the most interesting questions of the afternoon. CPFC was able to award the school a ball signed by the whole squad as a permanent memento of the day. They had also made sure that there were some goodies from the club in the bags that attendees took home with them alongside, SRtRC magazines and posters. A huge thank you to Susan Jackson and Rebecca Hurst from CPFC Study Centre for helping to organise and deliver the day and to CPFC for their continuous support. The club website also carries a report about this event. We look forward to working with both the Study Centre and club again in the future.